Since we've finally gotten a long-awaited gold limit increase for inventory, storage, and Trade House in the January 2019 patch (despite not being mentioned in the patch notes) that took Eyedentity many years to implement and which allows us to make safer cash item trades via the Trade House (at least, the ones which are able to go into the Trade House) in one go, instead of having to trade gold separately, and eliminating the risk of items being stolen in front of our noses (conversion costume anyone? ), we still lack a safe way of selling other cash items. I want to suggest a system for selling items in a "safe" way, which can be used for both regular items as well as cash items coming directly from the cash shop. It should be recognized by Cherry Credits and Eyedentity that many players sell items to others from the cash shop by "gifting" these directly and receiving payment for it from the person receiving. This happens because not all items can be placed in the Trade House. If one gifts an item first, they don't know whether they will be receiving gold for it. If what was promised is not received, this ends up being a scam. And we've seen too many scam cases in Dragon Nest Europe for years due to the lack of a safe trading system. Cherry Credits doesn't take action and tells us "its allowed to trade, but at your own risk." No proper support is given by Cherry Credits to those affected by scams, leaving much space for scammers to abuse, and many frustrated, scammed players. Cherry Credits is unable to confirm the deal made between players, as this can happen outside of the game, or in ways they simply aren't able to confirm. Now read carefully: instead of using the currency slots to input gold, silver, and copper, we can use this to set a price for the receiving player to pay before they are able to obtain the items attached to the mail. 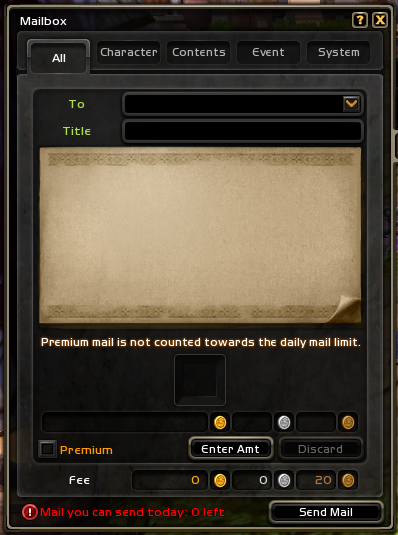 When paid/accepted, this money gets sent back to the sender, similar to how players receive gold in their mail for selling an item on the Trade House. When the player receiving the mail decides not pay by declining, or taking over 12-24 hours (similar to how we can set a time on the Trade House), or if the sender decides to cancel the pending mail, the items can be sent back automatically to the sender. If the cash item is being sent directly from the Cash Shop (instead of the CC item inventory), instead of returning the items to the sender, the amount of CC (or DNP) spent, could simply be returned to the sender, as if they never sent it, allowing the player to spend the CC (or DNP) in another desired way. As the sender may not have any personal use for the cash items requested by another player. All of the options/features (or game elements) required to do this already exist in the game, and would only require some re-arranging and additional coding to make it work. From experience, any developer familiar with the game elements should be able to make this work without having to spend too much time. Of course, extensive testing to make sure things work as intended would be required. By settings things up this way, or similar to it, Dragon Nest can have a safe and scam free way of trading, saving both players, Cherry Credits, and Eyedentity Games a lot of support tickets and frustration. I believe players are tired of being scammed, or having to deal with scammers simply because Dragon Nest lacks a safe trading system. While increasing the gold limits on the Trade House and trade windows has helped to some extent, we're not quite there yet. If you support the idea of safe (cash) item trading via a system like this, please leave a like on the post to show your support. If you have any further input or comments regarding this idea, please leave a reply below! 5 users thanked Yami for this useful post. especially for new players not familiar with names and methods we using. They can be easly targeted by scammers sadly. I heard many situations when new or even old player got scammed and simply just left the game. anyway it can happen before landing in the right place. ​​​​​​​That's why it's worth putting effort and time into this. Agreed, this is a simple yet good solution. I wonder why Eyedentity never even bothered about scamming problem tho.